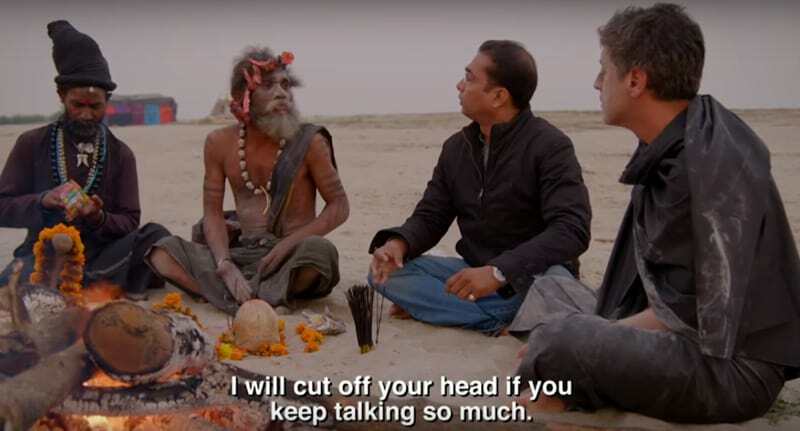 Believer, a new CNN documentary hosted by religious scholar Reza Aslan, premiered on Sunday with an episode focusing on an obscure Hindu sect that practises cannibalism. During a meeting with an Aghori guru, Aslan had his face smeared with cremated ashes, drank alcohol from a human skull and ate a piece of cooked human brain. If you’re wondering what human brain tissue tastes like, it’s similar to charcoal, according to Aslan. But none of that compared to the intense argument that played out afterwards. Should we eat the living? Shall I show you by eating my own flesh? Then call me an Aghori. Visibly distressed by the threat, Aslan beckons over the camera crew before admitting to the show’s director, Ben Selkow, that he believes the meeting may have been a mistake and that he would like to leave. The Aghori member then begins throwing his own waste at the camera crew. But the scene – and the documentary – hasn’t gone down well with everyone. A number of Hindu activists and leaders are angry, saying it depicts their faith in a sensationalist manner. Hawaii representative Tulsi Gabbard, the first and only Hindu lawmaker in the U.S Congress, tweeted Tuesday that she was ‘disturbed’ by the show. Extremely concerned that while they are not Aslan’s intentions, erroneous depictions, misleading imagery, and provocative first half of the program could exacerbate Hinduphobia in the face of widespread religious illiteracy about Hinduism. Critics also took to Twitter to share their dismay during the episode’s airing, but Aslan and Selkow encouraged people to keep watching. Later in the episode, Aslan meets with non-cannibalistic Aghori members who care for people with leprosy and run an orphanage. CNN’s website also offers a more balanced view of the topic.